Tokyo is a city filled with tourist attractions and activities that fill the itineraries of visitors of all ages. Tokyo alone has thousands of shrines and temples, two Disney parks and rambunctious shopping districts that showcase endless streaks of fashion and food. Here is a sneak peek at the variety of foods you can eat in Tokyo. Pompompurin Cafe’s omurice. The dish is designed after Sanrio character Purin, a golden retriever wearing a beret. Kawaii — the culture of cuteness — is one characteristic that distinguishes the country from other parts of the world. The cuteness culture in Japan, similar to a few East Asian countries, is seen everywhere from photobooths where cute filters dress the faces on screen, to the food you eat. 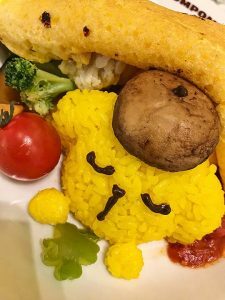 Pompompurin Café in Tokyo’s Harajuku district is one of many eateries where you will be served dishes decorated to meet your cuteness standard. Although Hello Kitty is the more popular character associated with Japan’s Sanrio brand, Pompompurin is another popular Sanrio character. There are even restaurants named and designed after the pudding-shaped golden retriever with the signature dark brown beret. Look familiar yet? Okonomiyaki is a dish cooked with a variety of ingredients, but nothing is better than the classic okonomiyaki with ingredients found in Japan. The next dish may befamiliar to some of you. 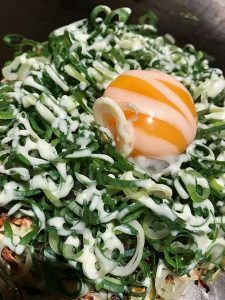 Tasty Los Angeles even created a video introducing Hiroshima-style okonomiyaki — a savoury pancake topped with several ingredients you can easily find in your own kitchen like eggs, green onions, cabbage and meat. Tasty producer, Rie McClenny, describes the dish as a “budget dinner” because of its inexpensive ingredients. “It’s a good blend of savoury flavours topped off with the signature Okonomiyaki sauce,” says University of Calgary engineering student, Fernando Valera, after visiting Japan this summer. Valera says the dish is his favourite from Japan after having tried foods from different parts of the country. There is not a single way to create an okonomiyaki as the dish has been cooked and served in different ways. But if you want to stick with the original, some of the necessary ingredients may only be found in Asian supermarkets like tempura bits, okonomiyaki sauce, Japanese mayonnaise, dried bonito flakes and green seaweed, to name a few. This pudding was sealed in a plastic egg and served with an ice pack. It’s milky consistency makes it unique from anything else in the market. Pudding is a personal favourite. This pudding, however, has been sealed in a plastic egg, chilled and served with an ice pack to keep the structure intact. 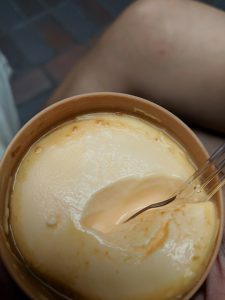 The creamy texture makes it different from other puddings on the market, especially those that are quite gelatinous in consistency. Hints of caramel blend into every spoonful because underneath lies a small amount of what tastes like a light blend of caramel sauce. This pudding-filled egg can be found in the streets of Shimokitazawa in Tokyo or at the Disney Resort food court next to the Disney Resort Line — a monorail that takes guests to major destinations within the resort. Believe it or not, this hot soup of oden is commonly found in convenience stores in Japan like 7-Eleven. There is tofu in the centre, a fried tofu fritter below and a yakichikuwa next to it. 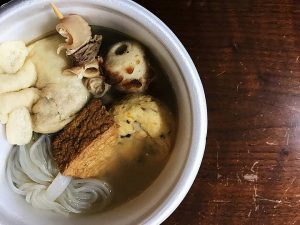 Similar to the taste and texture of fish ball, yakichikuwa is a cylinder-shaped treat with a hole in the centre that adds the perfect fishy taste to the savoury broth. On a stick are beef tendons and the little pouch next to it is mochi — sticky rice cake — wrapped in fried tofu. 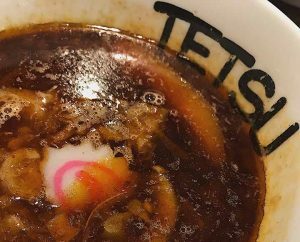 Tetsu is a popular ramen shop in Tokyo that serves both ramen and tsukemen. Last but not least, is a variation to how we usually eat ramen. Tsukemen is served with the broth and noodles separated and is known to be better than serving them together. The noodles have to be dipped in the broth before each bite. Odd enough for you? According to Japan travel magazine, Matcha, tsukemen noodles are washed quickly after the boiling process. That allows the noodles to have a better feel and stops them from expanding in the boiling water. The extra step taken ensures the perfect noodles.